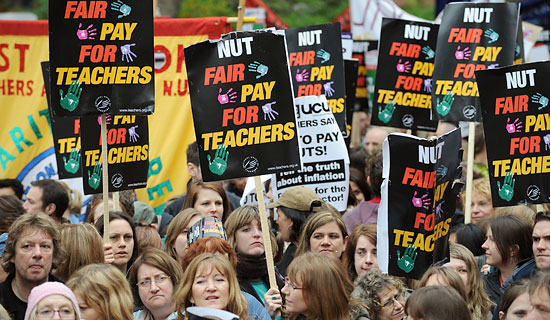 Despite a vote in favour of discontinuous strikes over below inflation pay, the National Union of Teachers has announced there will be no further action. A quarter of a million teachers walked out on April 24, disrupting nearly 10,000 schools in action which inspired many other workers in their fight against the government's 2% pay cap. This at a time with inflation running at around 5% constitutes real terms pay cuts. However, the NUT then declined to ballot for action coordinated with other school workers in UNISON who struck on July 16-17. Then months of inaction passed before teachers were re-balloted for further action. Over this period other groups of workers had been isolated and defeated, particularly local government workers. Also, the financial crisis had begun to bite and many teachers felt that they would lose public support by striking a pay when others were losing their jobs. This resulted in a narrow margin in favour of action - 52% down from around 70% prior to April. The union's announcement marks a huge setback for workers opposed to real terms pay cuts, as teachers were potentially one of the most powerful affected groups due to their ability to disrupt the whole economy by closing schools and thus preventing parents from working as well if they walk out. Following this decision, the civil servants union PCS also suspended their strike action scheduled for November 10.